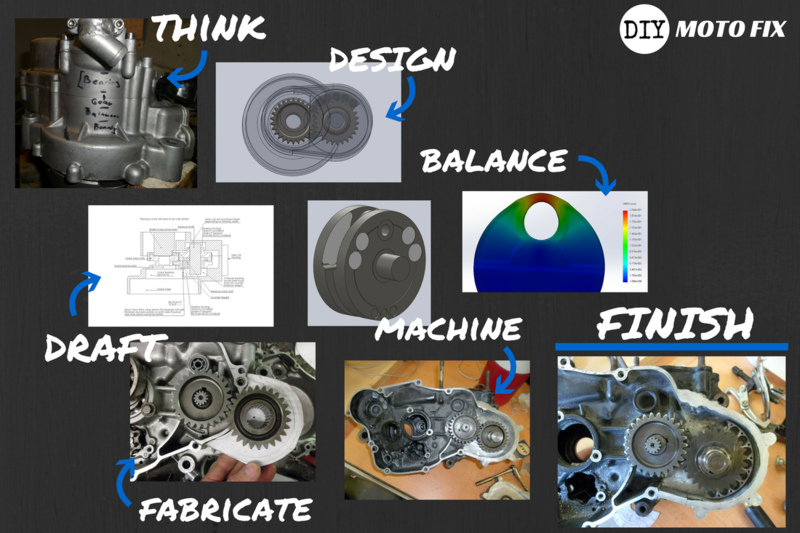 If you are a tech ed teacher on the prowl for affordable engineering posters to hang in your classroom, DIY Moto Fix has got you covered. These print-yourself 24" x 36" posters are instantly downloadable to your classroom computer, where you can then print them off yourself or through a printing website. We personally recommend VistaPrint and Staples who both offer large format affordable custom printing. Once you purchase our poster, you can upload the high resolution file to a printing site and then select whatever size you want. These posters were specifically designed for large format printing, 24" x 36", but can be scaled down to a smaller size if desired. Our posters are on a "Pay What You Want" pricing model. That means you get to evaluate all the time and effort we've put into the posters and choose how much you think our work is worth. With one high resolution 36" x 24" printable poster, we recommend $5. For the three pack poster bundle we recommend $12. But the choice on price is completely yours! The motorcycles and engine pictures in these posters were designed and built by DIY Moto Fix's Paul Olesen. Paul is a powertrain engineer who has worked in the motorcycle industry and on racing teams. He has a deep passion for bringing the love of engineering to all riders and enthusiasts, but especially kids. 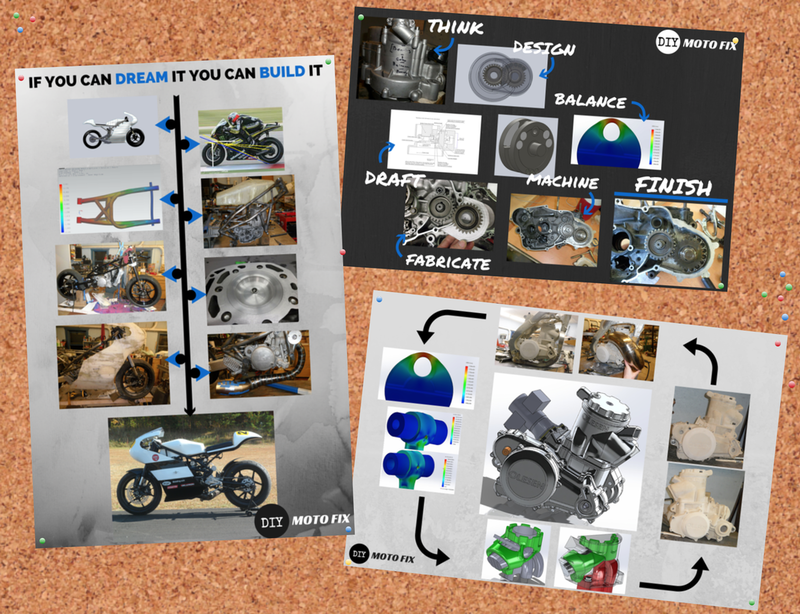 Inspire your classroom to dream and build with DIY Moto Fix's motorcycle engineering posters. By supporting DIY Moto Fix, you help us spread professional-grade knowledge. Scroll down and select your desired poster below by clicking the "DOWNLOAD NOW" button. Includes the Motorcycle Design poster, Engine Counterbalance poster, and Engine Design Educational Poster. Features the drafting, designing, balancing, and machining of a engine counterbalance shaft. 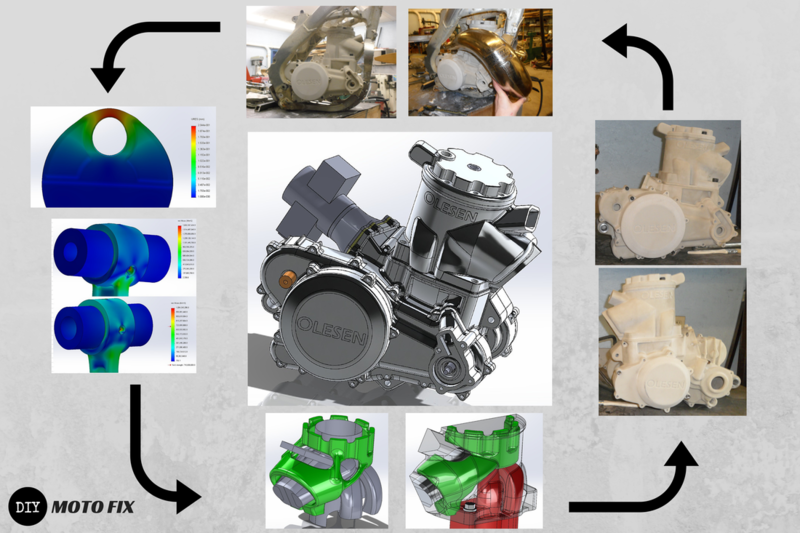 Features the modeling, designing, 3D printing, and fabrication of a two stroke engine. 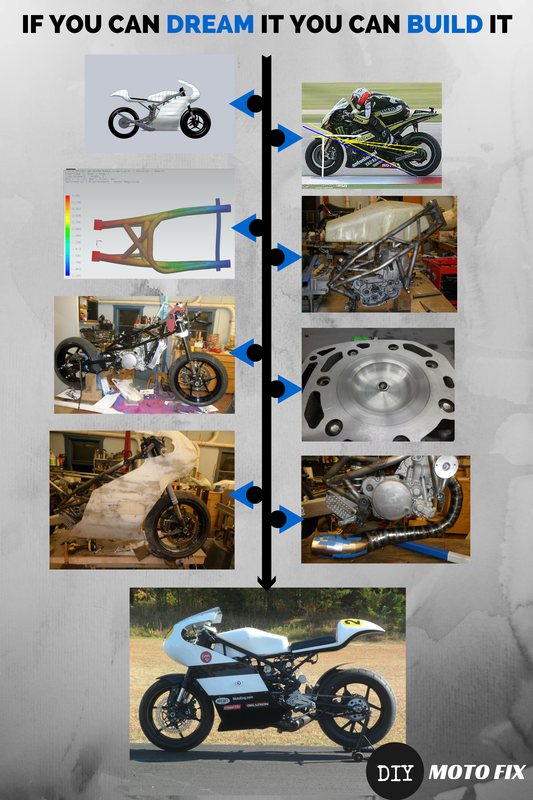 Features the layout, designing, finite element analysis, fabrication, assembly, and final construction of single cylinder racing motorcycle.